In this overview of human body fat both subcutaneous and visceral fat are defined, followed by a short description of how to deal with both kinds of fat with diet, exercise, and lifestyle changes, as well as cosmetic surgery. Here, and across the Western world, obesity is a growing problem. Extreme weight gain is quickly becoming a major global health hazard, thanks to the increasing availability of calorie-dense foods and largely sedentary lifestyles. This puts countless people at heightened risk for diabetes, dyslipidemia, hypertension, cardiovascular disease, arthritis, and a variety of cancers. That being said, not all fat is created equal. Human body fat can be broken down into several categories, but the most important two are known as subcutaneous and visceral. Only subcutaneous can be treated with cosmetic surgery treatments, such as liposuction. Subcutaneous fat is found just beneath the skin, and is the kind of fat that you can see and feel all over your body. “Subcutaneous” literally means “beneath the skin,” so it should come as no surprise that this kind of fat is found throughout your body. It usually makes up about 80% of all your body fat. It can accumulate in certain areas such as your thighs, underarms, or belly, but it is present everywhere, even on the soles of your feet. Some subcutaneous fat is necessary for your body to function properly. It helps keep you warm in the winter time, act as a sort of shock absorber and can provide your body with much needed energy, to name a few examples. Since this is the fat that most people are aware of through personal experience, you're probably familiar with its more unsightly presentations. Subcutaneous fat is responsible for most “pear shaped” body types, where fat is concentrated in the lower body. Too much subcutaneous fat can give the skin a stretched or tight look, resulting in dimpled skin. While everyone has subcutaneous fat, some people have more than others. The number of fat cells in your body is determined by genetics, so some people are predestined to have fewer while other have more. 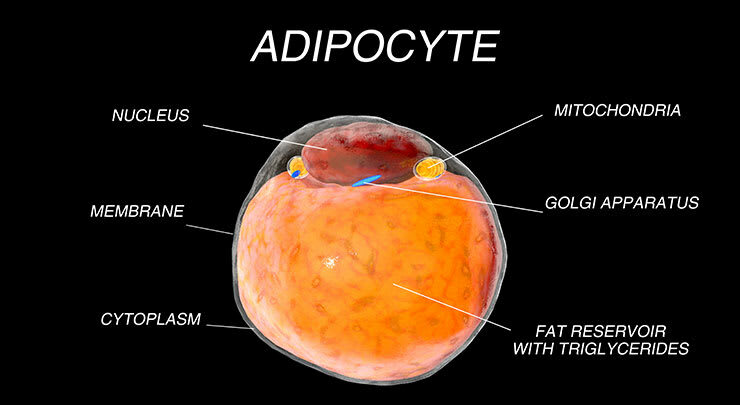 That being said, the number of fat cells you have in your body does nothing to determining your overall weight, which is dependent on how much fat is stored in each cell. This is determined by how many calories you ingest, your activity level, and to some degree, genetics. Visceral fat is the second kind of fat that your body produces, and is the more dangerous of the two. This kind of fat is a lot more difficult to detect than subcutaneous fat because it is deep inside your torso, surrounding your heart, liver, lungs and other internal organs. Generally speaking, those with a more “apple shaped” body (more belly fat) have a higher percentage of visceral fat. That said, even thin, seemingly healthy people can fall victim to this fat, which is ultimately responsible for heart disease, metabolic syndrome, high cholesterol, diabetes, breast cancer, and dementia. 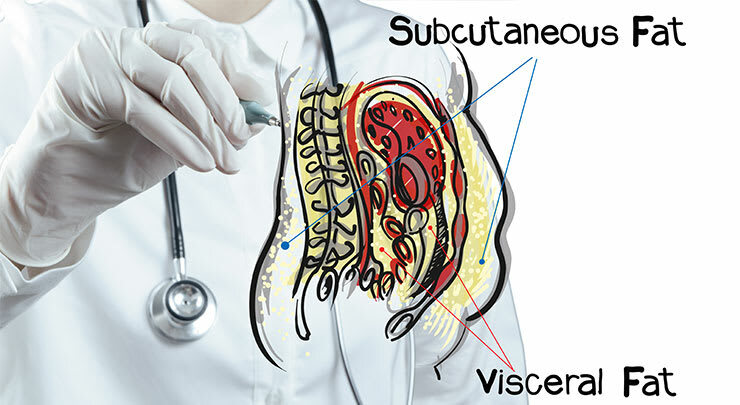 Visceral fat is more dangerous than subcutaneous fat because deposits of this deeper fat can act similarly to an organ, creating substances that negatively affect the organs and body systems it surrounds. It is thought that this abdominal fat is particularly risky because of its location near the main vein that carries blood to the liver from around the intestines. The risk comes from the excreted substances from the visceral fat entering the liver and influencing the amount of bad cholesterol and fat in the blood. This fat can literally shave years off the end of your life. There are a number of contributing factors for the development of visceral fat. The first is also the most obvious: high calorie, high fat or high sugar foods, and an inactive lifestyle. Going without exercise for long periods can cause a snowball effect where you to start gaining abdominal visceral fat more quickly over time. Missing out on sleep, and high stress levels are also risk factors. Some causes are, unfortunately, out of your control, like aging. Growing older generally causes us to gradually lose muscle mass, leaving a higher percentage of fat behind. Aging also changes the way we burn calories, making it easier for abdominal fat to accumulate. And lastly, just like subcutaneous fat, some people are just genetically predisposed to having more visceral fat than others. Subcutaneous fat is stubborn, responding slowly to diet and exercise. Because your body wants to store this kind of fat in case of starvation or other emergencies (or for childbearing in the case of women) it can be difficult to work off. Luckily, while it may not be very aesthetically pleasing, it isn't as dangerous as visceral fat. Liposuction is a popular option for removing subcutaneous fat. This extremely common cosmetic procedure has been around for decades, proving itself to be both safe and effective. However, if you do not change your eating, exercising, and lifestyle habits, you run the risk of gaining at least some of the weight back. Liposuction removes up to 80% of the fat storing cells in the subcutaneous tissue. This means that following the procedure you will have only a fraction of these storage cells remaining. 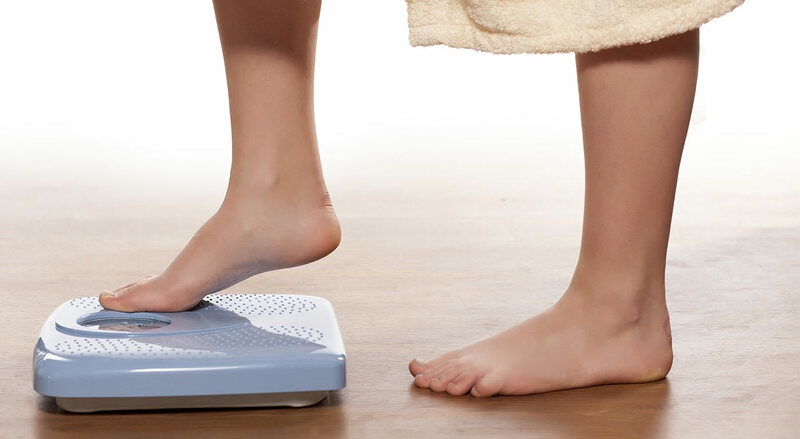 When you gain weight, fat is stored evenly throughout your body. Since you will have significantly fewer fat cells following liposuction, any moderate weight gain should remain proportional to your new figure. However, with a weight gain of more than 10% of your total body weight it is possible for new fat cells to develop, even in the treated area. In the most extreme cases, this could potentially undo the results of your liposuction, but this is rare. The more dangerous visceral fat is significantly less stubborn than subcutaneous fat. This is good because due to its location, liposuction, abdominoplasty and other cosmetic surgery treatments cannot be performed to remove it. A loss of five to ten percent of your total body weight can have a profound impact on visceral fat stores. The best way to deal with this deeper fat is bring your caloric intake down below the number of calories you burn per day. In order to lose a single pound a week, you need to burn 500 more calories than you ingest every day. This means more exercising and a possible change in diet.